The weather in Japan was like it has been here in Brighton, for the last few weeks, except much more intense and humid, so I have been reminded of Japan on a daily basis – moving through the days drinking Pocari Sweat, gallons of cold green tea provided by the Art Lab girls, water and then around I would go again. From meeting, to drawing, to port site visit, to the park, to rehearsing the script, to writing, to meeting, to bed and on and on. A rare and privileged moment for me, one of total focus and determination in my life, where gaps close up and people come rushing towards something. This was not an emergency, this was not a disaster, this was our work. This was something we constructed, an attempt at responding to something unprecedented, at articulating our position in it all. We are left changed forever but the boat is gone and the work is not there. There is the film, there are photographs, the story, the blog, a few drawings and all the people that made it happen. And sometimes it feels like I imagined the whole thing. Enquiries in our work have expanded and are forever changed too – we talk about it all the time, what people do or can do, what work can be, what our relationship is to what is going on in the rest of the world and how we should tackle this responsibility as artists. The Japan Tsunami of 2011 was a force of nature, The Thing I’ll Be Doing For The Rest Of My Life, a force of will made by people. We take these memories with us into the future and believe even more, how, when we think we know what might happen, something is always there to pull the carpet out and, how, someone can always be there, watching out for you. 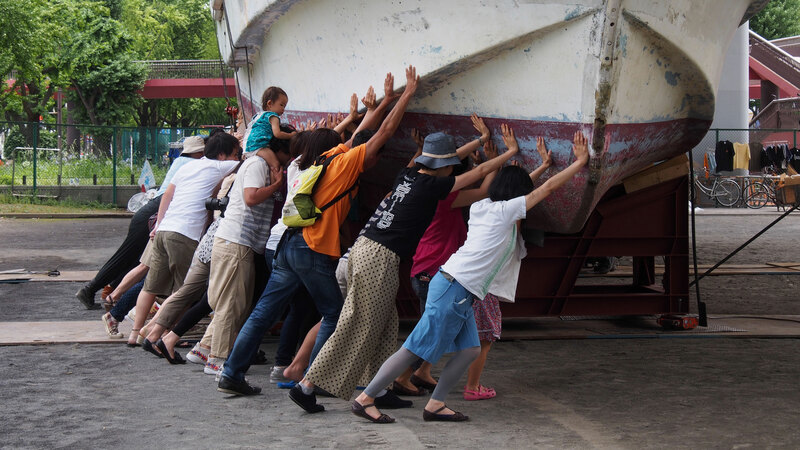 “[…] the boat is gone”, the boat is not gone: the artist and participants made the work, and the work made the artist and participants. Bravo! 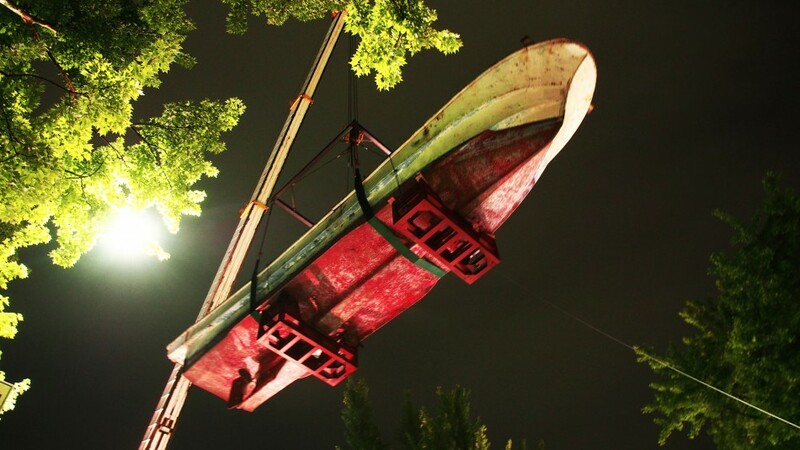 Very delicate piece, beautifully balanced against the “bulkiness” of the boat, people dragging it across streets, cranes and ferrous materials…and, above all, in contrast with the formidable force and unpredictability of natural disasters.